What do Panerai and Porsche have in common? No, not the same first letter in their names. Quoting a line which I remember vaguely from Top Gear's Jeremy Clarkson " Porsche has launched a new 911. And it looks exactly like the old one!" Like the 911's chassis, the Luminor's case shape has barely changed over the decades. Like Porsche, Panerai has decided to stick to a winning formula, it seems. The porsche 911 comes in many guises - the 911 Carerra, 911Turbo, 911 Carerra S just to name a few. Similarly, the Panerai 1950's case is used in a wide array of offerings like the PAM 320, 321and 359 just to name a few. However, the reliance on a recognisable shape and design allows both Porsche's and Panerai's products to be instantly identifiable. Honestly, I see nothing wrong with that. When there's no need to design a better mouse trap, why bother? The 422 comes in the wake of the immensely popular 372. It utilises the same 47mm case as the 372 and 423 but lacks the historic looks of the 372. The matte black dial is married with gold stick and Arabic markers (12, 3 and 6). Golden hands add that vintage feel to a modern rendition of a timeless classic. I prefer the presence of a second sub-dial on my PAM's. I like just that bit of clutter. That lop-sided, asymmetrical look of an otherwise, overly plain dial. Oh, did I mention it's a sandwich dial as well? I personally prefer sandwich dials. One of my main concerns lies with the case. The 1950 case is rather huge. but not that chunky. Yes I have larger and thicker watches in my stash but what worries me about this particular beast is it's completely polished surface. Which translates to a potential ding magnet. Otherwise, there is nothing not to like about the classy lines of this very well finished cushion case. What sets this case apart from the other Luminors is its unique shape. From what I understand, this case shape is a little different from previous offerings like the 000, 005, 111, and even the later models like the 320, 312, and 359. This cushion case is similar to the Radiomir's. Now, instead of wire lugs, it is fittted with the Luminor's signature thick lugs, and and chunky crown guard. I am rather let down by the crown guard, actually. No, the build quality is fine. I feel that at the price they charge for this watch, they should at least match it with a polished device rather than one that is obviously mass produced for their other offerings as a 'one size fit all' solution. This piece features a transparent case back which allows you a glimpse of the in-house P3001 movement. The P3001 is the same series of in-house calibres used in the 371 and 423 as well. This is a 3-day power reserve hand wound movement. The former has no power reserve indicator (PRI), while the later has one on the dial. The P3001 has it on the rear of the movement. I am also rather let-down by the see-through case back. It is a huge window, granted, but the movement is almost entirely hidden, much like a continental car's engine bay. You'll know what I mean when you lift the bonnet of a Merc or Bimma. It is a huge watch and it shows. There is that bit of overhang as a result of the relatively straight lugs. But I reckon it still looks pretty okay on my wrist. I wouldn't say the lume is legendary but it is typical Panerai. Vintage green and neat. And most importantly, it does the job adequately. The watch comes standard with a pair of assolutamente straps. These are the straps on the bottom of the photograph above which are not fitted to the 422. It's basically a Panerai-speak for nubuck. They are fantastic looking straps except for two minor details. Firstly, nubuck is similar to suede in texture. Therefore, if you wet it, it's doomed. Secondly, the stock straps are 26/22mm. I personally fel that the taper is too much. A 22mm Tang buckle is far too small for a 47mm case. As you can see, I managed to find a pair of straps that look almost like the original assolutamente, with a straigh 26/26mm dimension, and is not finished like suede or nubuck. And to top it off, it's a fraction of the price! this is the second PAM i have. The other is the 320. What I like about Panerai is how similar they look. So much so, that my dear wife still does not know I have two Panerais! She still think this is the 320! However, it might seem like I am rather disappointed with this PAM but honestly, I am not. I am rather pleased with it, aesthetically. 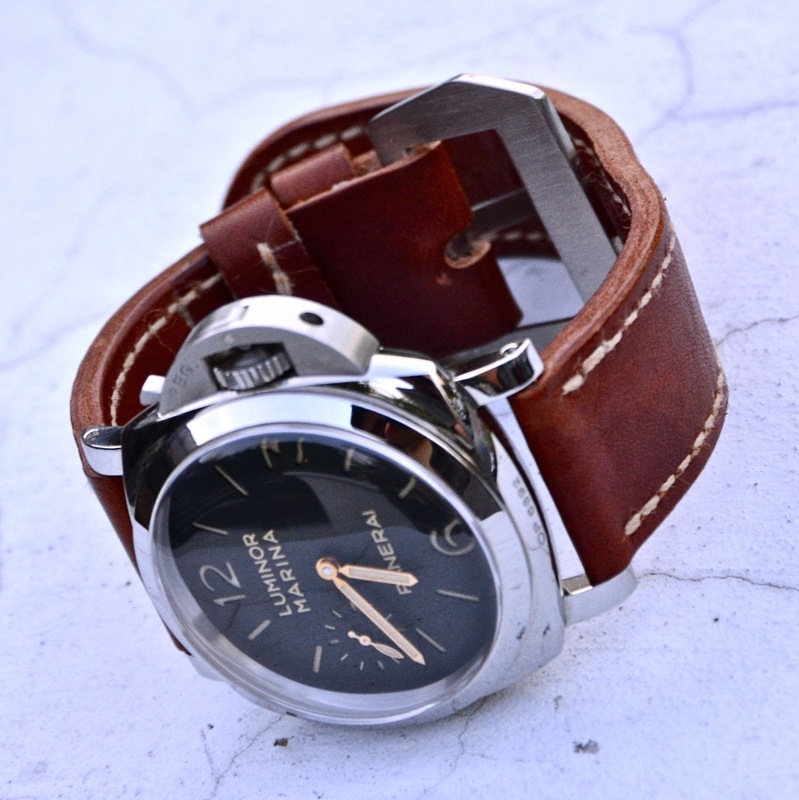 I like how Panerai has given a historic piece a modern touch. I like the overall vintage-inspired package. Most of all, I like the size and heft. And as with most PAM's the aftermarket strap options are endless. Unless it's a customised piece, it's impossible to own a watch that meets one's expectations in every detail. As such, I've chosen this watch for one simple reason - I like it! Movement : Calibre P3001 (Panerai In-house hand wound movement). Power Reserve : 3 days. Case Material : Polished Stainless Steel. - Size. It'a a huge presence, literally. - Aesthetically pleasing eye candy. - Plentiful aftermarket strap options. - Easy to smuggle hone without wife knowing. - Stock straps (26/22mm) not proportionate to the watch size (47mm). - Crown guard not polished, does not match polished case. - Movement is too covered up. I'm glad to see that you're enjoying the 422. Thought I'd just share my thoughts on what you said about the "unpolished" CG. Actually if you look back at Panerai's DNA into its vintage and PreV days, you will find that the brushed CG is a fixture in most of Panerai's watches back then. From the legendary 6152s to the much coveted PreV 201a, you will find a polished midcase matched with a brushed CG. Hey thx! Thx for that bit of history trivia. I did not venture into Panerai's history that far back, to be honest. Hmmm... maybe another way of looking at it is that mass production or rather, economy of scale played a big role even during the pre-v days? HAHA. After a while looking for Panerai and considering the 504 and 505 Radiomirs I went for the Panerai classic look of the Luminor, I just got the 423 and it is awesome, very pleased with it.